The morning shift from Paul Vincent on Vimeo. The wettest summer on record has come to an end. Dartmouth Regatta marked the close of the holiday season once more. Boats were moored up, caravans towed away, tents packed, holiday cottages emptied, children returned to school and, of course, the rain stopped. Here we are once more in a soft September bathed by the gently sinking sun. My long-legged shadow precedes me as I climb the hill to the top fields. Morning mist hangs over the river and steam seems to rise from the grass as it warms in the sunlight. Great skeins of squawking geese circle above before crash landing clumsily in the creek. Buzzards whirl overhead, crying their laments as they ride the thermals. Autumn is here again. The land has suffered from so much summer rain. The wettest June for years was followed by a soaking July and August. And now mildew creeps stealthily through the garden. Vegetables rot in the ground never having matured, beans brown on their supports. All my potatoes, infested with wire worm, must be burned. Sweet corn refuses to ripen, courgettes wither. The vegetable garden is a disaster. The quince tree has some strange disease making me fear for its future. No wild plums glisten in the hedgerows; apples are sparse, blackberries too. 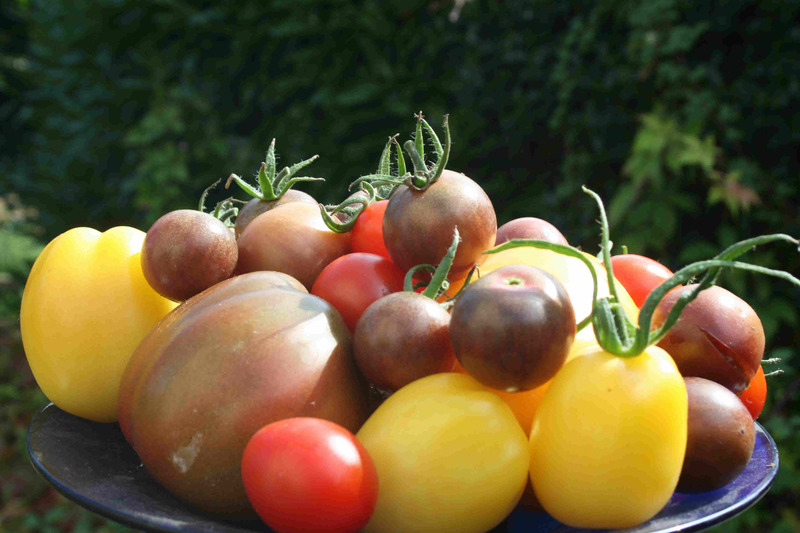 Only the heritage tomato seeds out shine expectation. Though late, they are producing abundant weird and wonderful fruit. 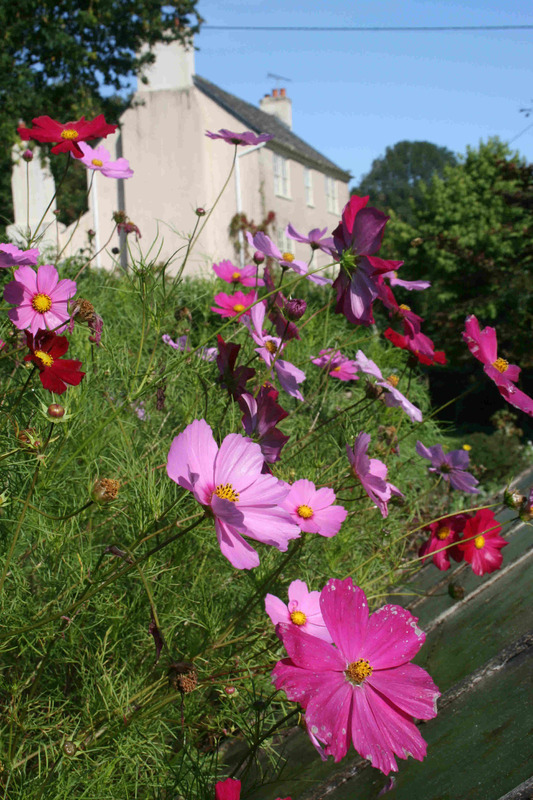 And the cosmos are magnificent this year. Just one little packet of seeds has overwhelmed the garden in an uplifting blousy pink and white froth. I had so many seedlings I just shoved them in everywhere and anywhere and the result is unexpectedly wonderful. 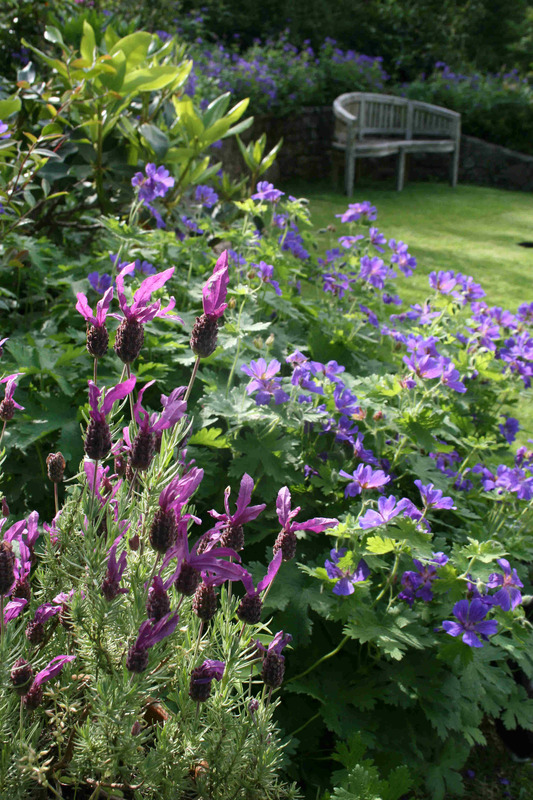 They sway gently in the breeze amongst giant anemones, hollyhocks and verbena bonariensis. They crowd in between the roses and fall over the hydrangea paniculata. What a bargain, just one little packet of seeds! 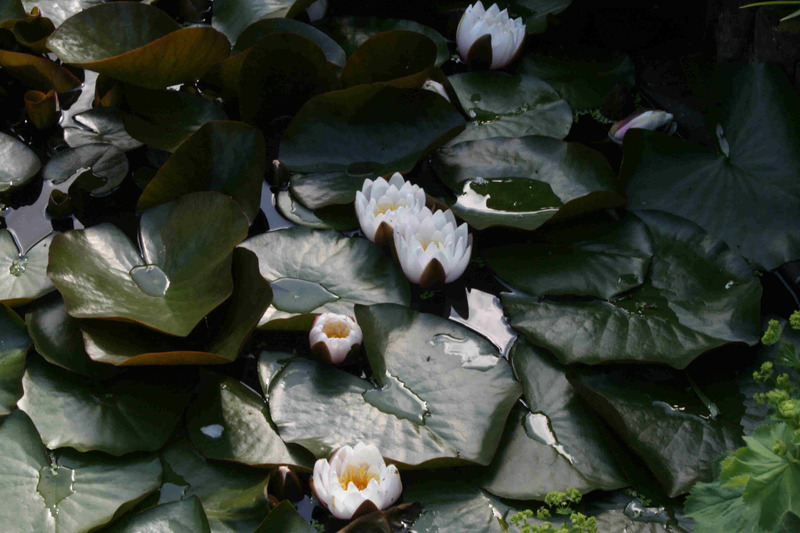 Despite all the rain our National Garden Scheme Open Days have been a wonderful success. 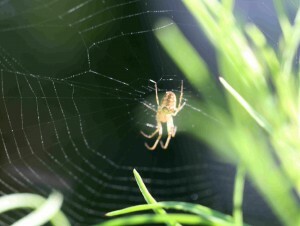 We were lucky here at home to have two rare dry afternoons in June attracting lots of visitors fed up with wet weather. But nothing prepared us for the enormous success that followed. 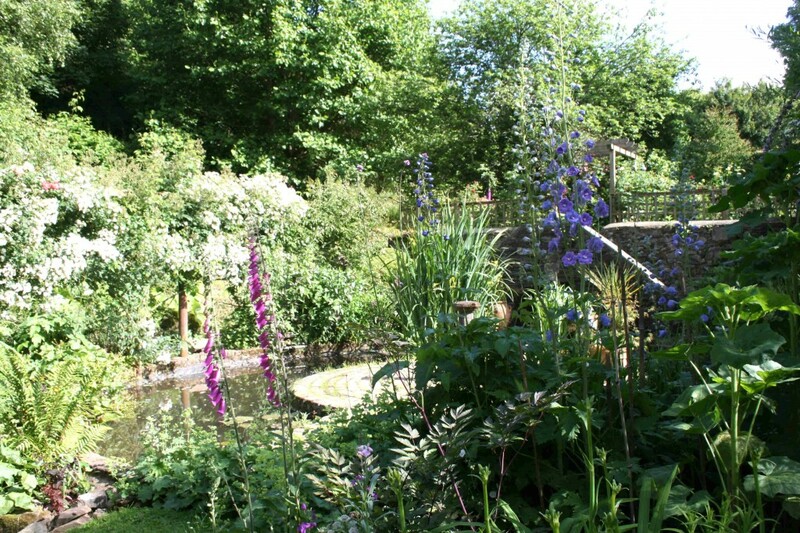 On the Village Open Garden Days in July the sun suddenly shone, the crowds flocked to the village, gardens were admired and cream teas leapt from the trestle tables of Middle Meadow! 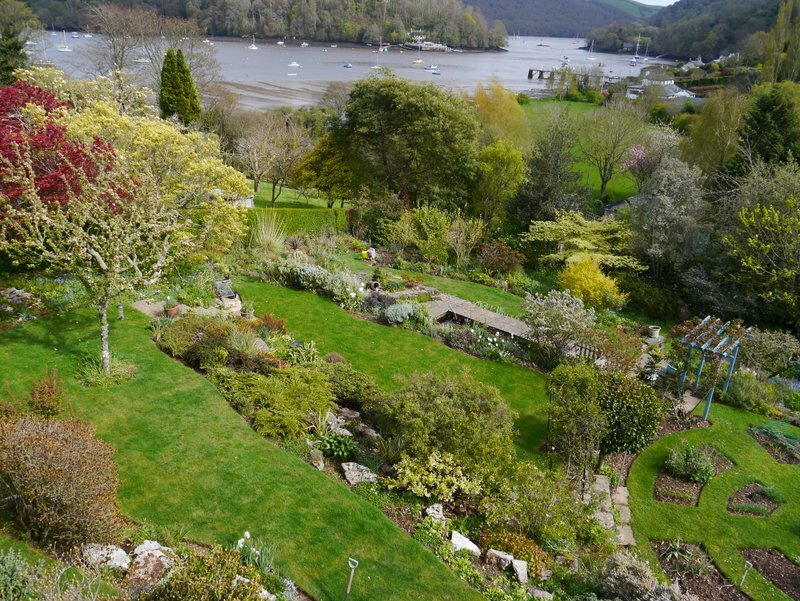 People climbed the steep hills and admired the river views; they bought plants, exchanged gardening stories and left the village happy and dare I say, inspired by our fantastic gardeners! The atmosphere was wonderful and support from the village amazing. And, best of all, we broke the County fund raising record for the summer; Macmillan, Marie Curie, Crossroads Care and Help the Hospices will benefit from all the hard work the gardeners put in across the year. A triumphant couple of days. I’ve just found the old copy of Country Living Febuary1994 “How to Survive Redundancy, a second career” etc. My, that took me back a bit! There we are photographed climbing the hill, pitch forks in hand and dogs in tow, starting our new life. We had already lived in our house for ten years when Thames Television lost its franchise and Paul helped to close down Thames’ Euston Studios agonisingly slowly, bit by bit, as transmission wound down over twelve months until finally he was able to write himself out of the script. He walked out of the studios after twenty seven years in television ”……I think it really hit me when the Transport Manager said “Can I have your car keys, please” and I realised I had taken a step quite without precedent in my life and I didn’t know what was going to happen tomorrow”. It all seems a life time away now. Strangely enough the very same year our neighbour, born in our house, decided to sell up and move away. Most of the land went to his relation, brother’s wife’s sister’s husband, across the valley. Fortunately for us we were able to buy back a very steep twenty five acres which said relation did not want, land which had once belonged to our house. With it came a large ugly 1970’s farmyard. We pondered our options; not a very promising farming potential. Lateral thinking was called for; fortunately we’re both good at that! We bought four sheep, a couple of Dexter cows, a few chickens and some turkey poults, oh, and quite a few books. And our neighbouring farmers were wonderfully generous with their knowledge too. 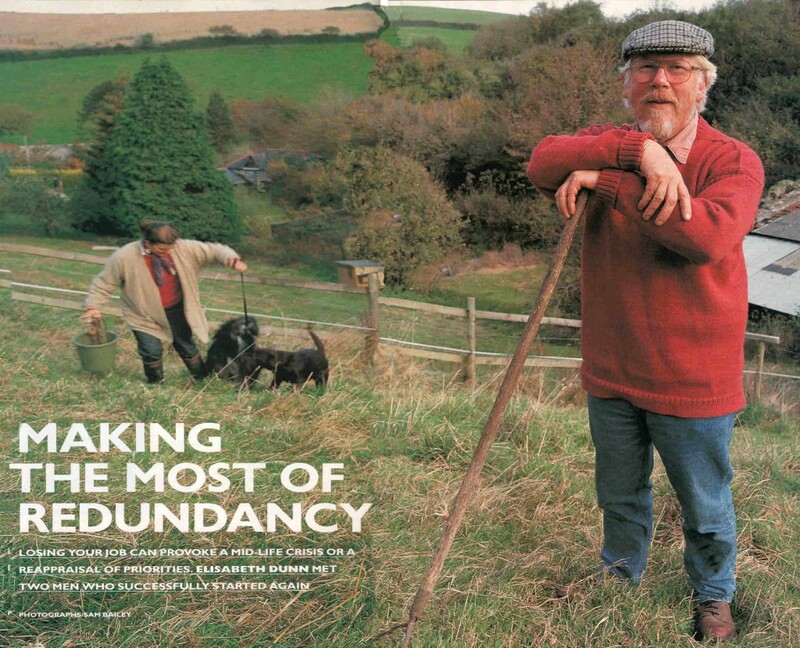 By 2000 we had built up a thriving little business breeding White Face Dartmoor Sheep, producing free range eggs, raising table birds for delivery every week, turkeys for Christmas and making up salad bags long before the supermarkets caught onto the idea. All this we delivered in our minute elderly refrigerated van to our fast growing list of regular customers. 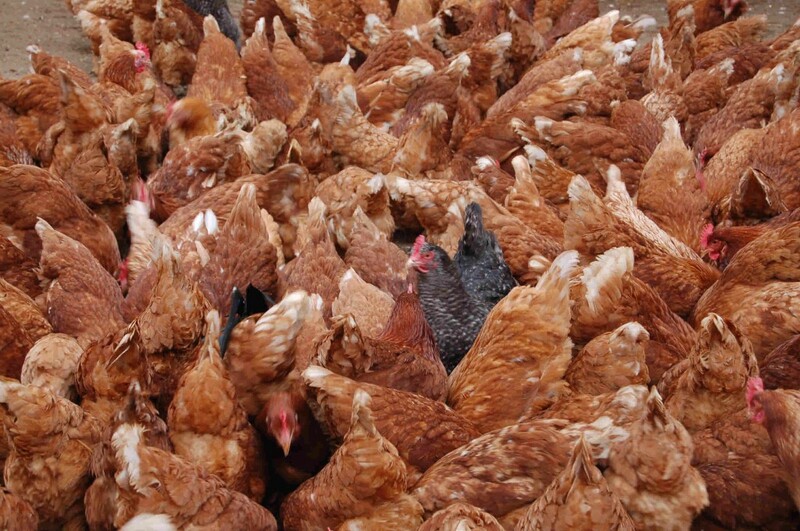 We supplied local businesses with our eggs, local hotels and pubs with lamb and chicken. One day a visitor in a big queue in the village shop was heard to ask how long our eggs kept. “About half an hour “replied a local wag. We knew we had arrived! Our weeks followed a regular pattern. From Monday to Wednesday I ran courses for Plymouth University and my own Psychotherapy practice in Totnes seeing private therapy clients and doing Clinical Supervision for NHS GP Counsellors. Paul farmed and killed and plucked the chickens. On Thursday as Paul continued with his work I began drawing and trussing the chickens. Then I packed, weighed and labelled them. I took the orders, worked, out the delivery route, wrote recipes to accompany the orders, picked salad and herbs from my polytunnel and made up the salad bags. I collected, graded, packed and labelled the eggs. We were approved and regularly visited by Health and Safety, Trading Standards, Environmental Health, MAFF which preceded DEFRA and the “Egg Inspector” who always made me giggle, poor man. Fancy being called an Egg Inspector….and Paul had, of course, done the appropriate training to be awarded a professional poultry slaughter man’s license. On Friday and Saturday Paul did deliveries while I cleared up, cleaned and caught up with paper work. On Sunday we crawled to church, planned the new week ahead, fed the animals, no one told them it was Sunday, and collapsed: some Hobby!!! Now, here we are, quite unable to retire, though we have cut back a little i.e. 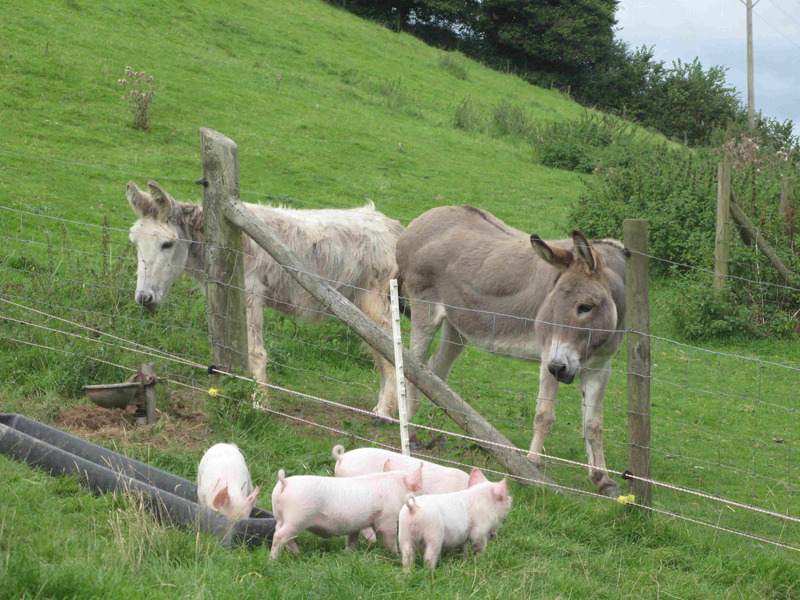 fewer sheep, less chickens, no turkeys, just three donkeys, two dogs, two cats, etc., and I’ve got into pigs! This is my second year. Paul is facing another new knee operation in a few weeks, I’m so glad he only has two legs. My partner in pigs is once again Stephen. 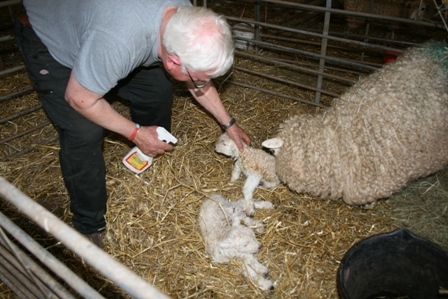 Last year we had three Middle Whites and three Berkshire between us. 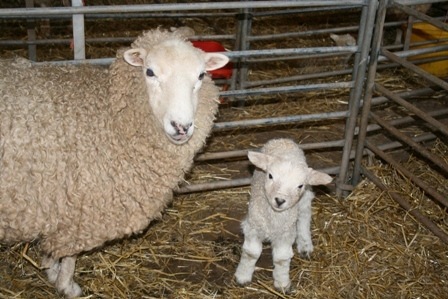 Having decided Middle Whites were favourite, six little fellows arrived last Monday. This time we have put them out in our big field, Sunday Orchard, were they are already busy wrecking the joint as only piglets can. Our neighbour and ex pig farmer kindly supplied us with a big ark which is fine now but may prove very cosy as they grow. They look so happy and inquisitive, digging and snuffling through the grass; so much nicer to see them in the fresh air rather than in a barn, however spacious. 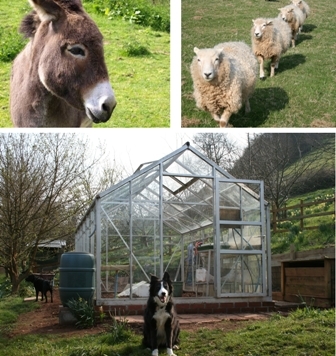 The donkeys came to take a look when they arrived, first the beautiful Nutmeg, then fat Luke and finally old Bunty: “What on earth do you call those”? This year’s ewe lambs ran down the hill, took a look, quickly lost interest and returned to serious grazing. The wethers and rams where more curious and peered at them for some time drawn by the sight and sound of a bucket of food. They came closer and closer to the electric fence lead by the now recovered senior pedigree ram, Big Dez. Poor old chap, having had his ingrowing horns removed, a somewhat traumatic event for all concerned, his face has healed and he’s able to chew properly again, putting on weight and back to his old self; sad though to have to lose those magnificent horns. Soon Dez’s work will begin again. In a few weeks he will be in with ewes once more busy making next years’ lambs. The pigs will grow fat and roast pork and bacon sandwiches will be on the menu again. 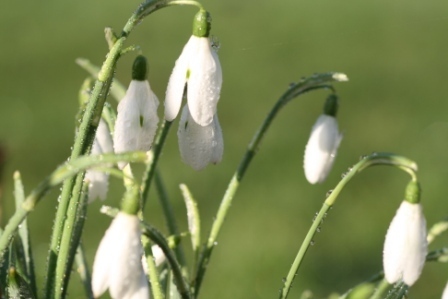 So the cycle continues; summer ends, autumn gentles us into winter and Christmas snowdrops point us towards the welcome of Spring. Round and round we go watching the valley change colour with each seasons’ individual beauty. 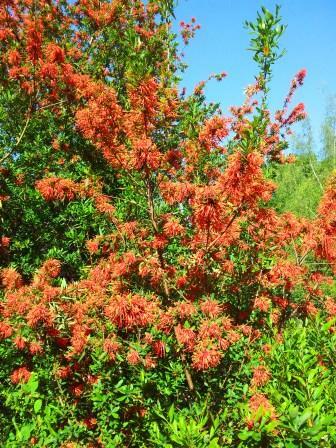 As I stare out of the study window at the relentless rain I realise that no sooner had I celebrated the gloriousness of May sunshine lighting up the scarlet Embothrium against an azure blue sky than the heavens opened. It has rained almost continuously ever since. Rain, rain, rain, not Raining Sideways, not the sideways rain of summer that drifts gently in a delicate curtain across the valley refreshing crops and clearing the humid summer air. No, just a straight forward, straight down deluge which has brought devastating flooding all across Britain; no sun, no break in the cloud, no comforting summer warmth, no uplifting glow of sunlight, just grey skies, low temperatures and Rain. 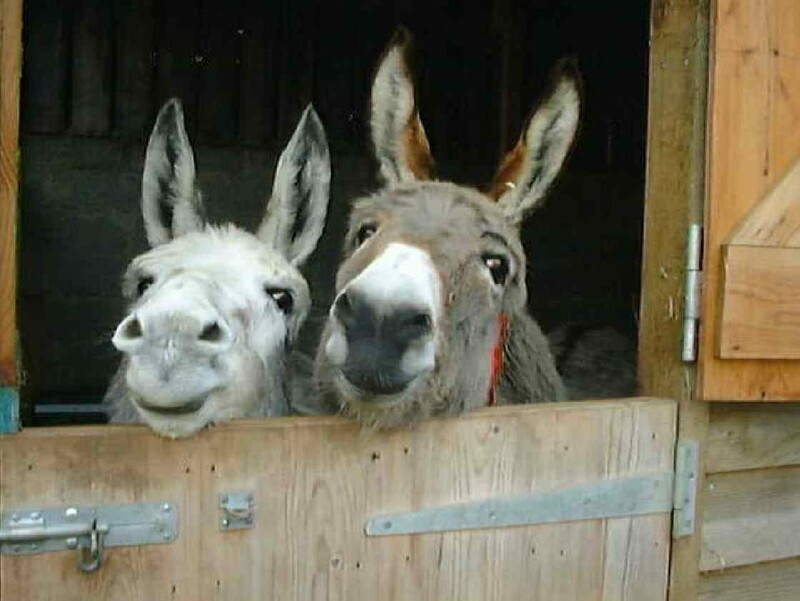 Donkeys get fractious in their big barn day after day eating straw instead of wet grass. Desert animals by origin, they don’t do well outside in wet weather unlike the sturdy ponies on the moor. Shorn sheep shelter with their fat lambs in the hedgerows and the chickens vote with their feet and stay inside. Cats race round the house playing rough games instead of hunting in the fields. Even the dogs give me a funny look when I suggest a walk over the hills in the rain. 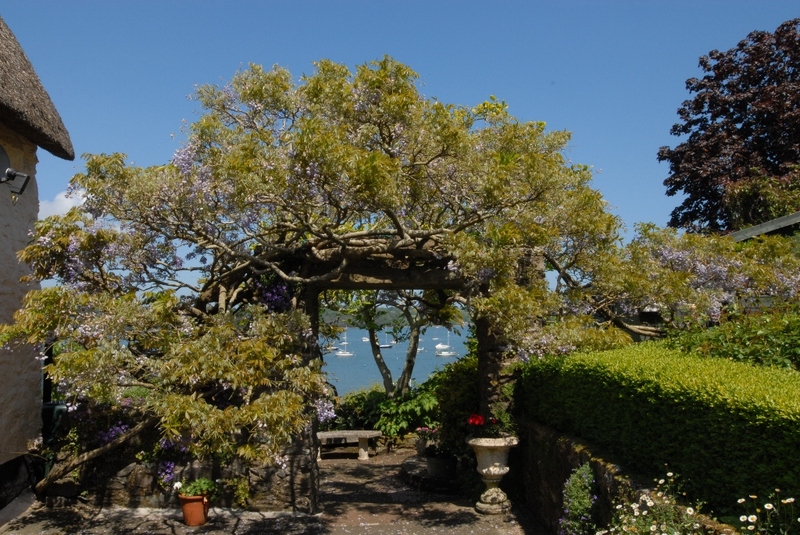 Next weekend, July 21st and 22nd, seven beautiful village gardens will open their gates to visitors for the National Garden Scheme. It seemed such a good idea planning it with Marina all those months ago in the warmth of a gentle autumn sun. Little did we know what nature had in store. Now all we can do is pray for two dryish afternoons. 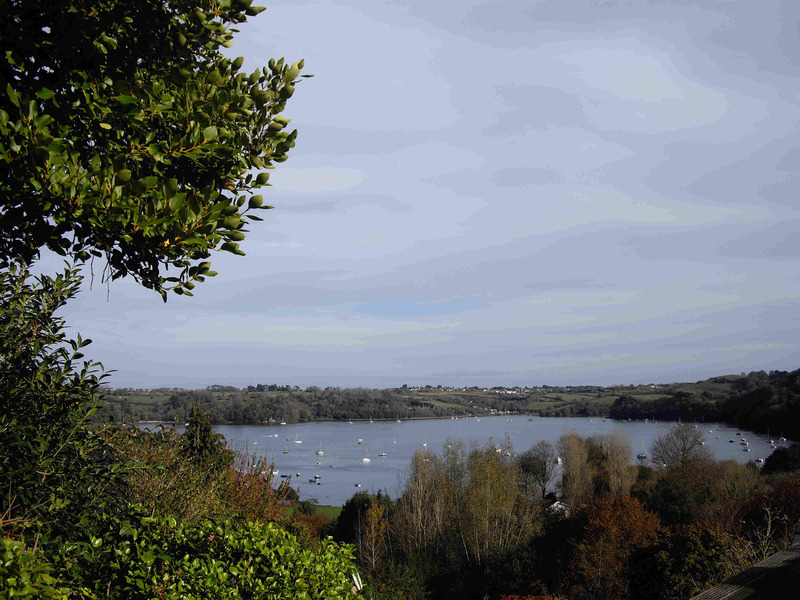 Dittisham is such a beautiful village. 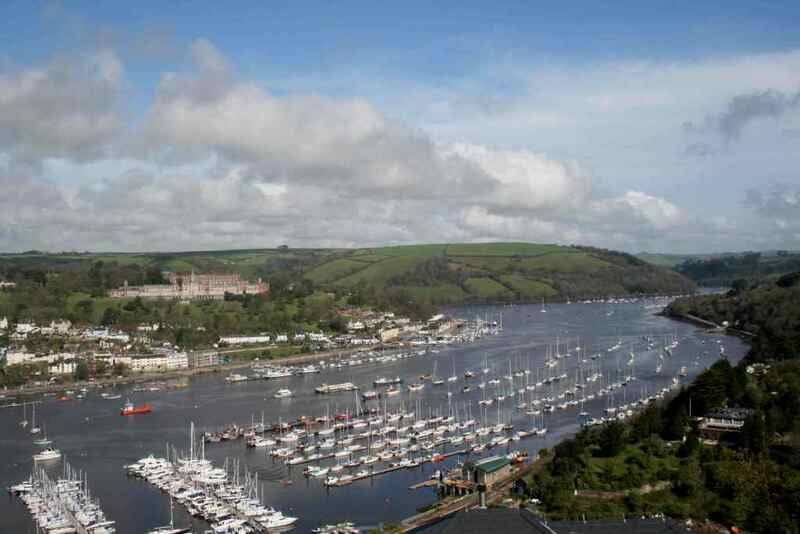 It overlooks the widest stretch of the River Dart just three miles upriver from Dartmouth. In the past, it has always been protected from the worst weather by rolling hills and the temperance of the Gulf Stream; a gardeners paradise. Thatched cottages with gardens filled with all the old fashioned favourites, look out across the river to Dartmoor in the distance. There are modern gardens too with contemporary planting, one even now under construction. 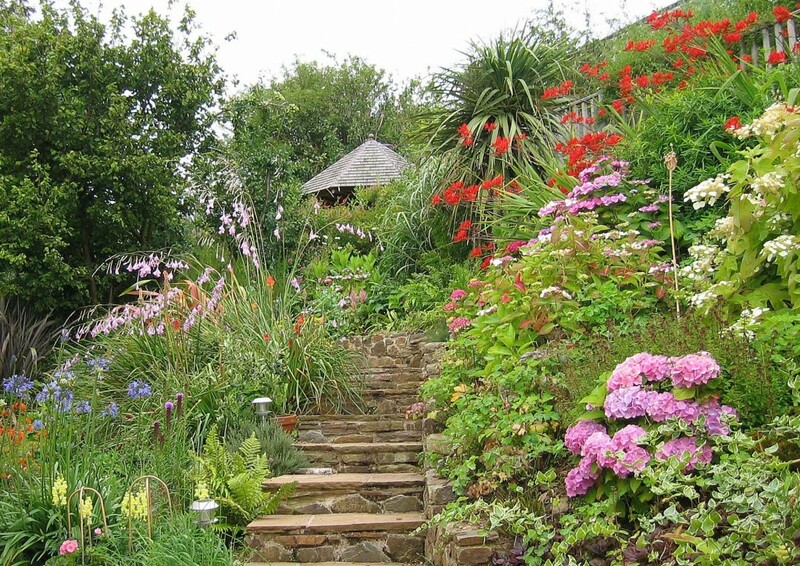 Terraced gardens cling to the hillside, and cream teas will be served on the sweeping lawns at Middle Meadow. 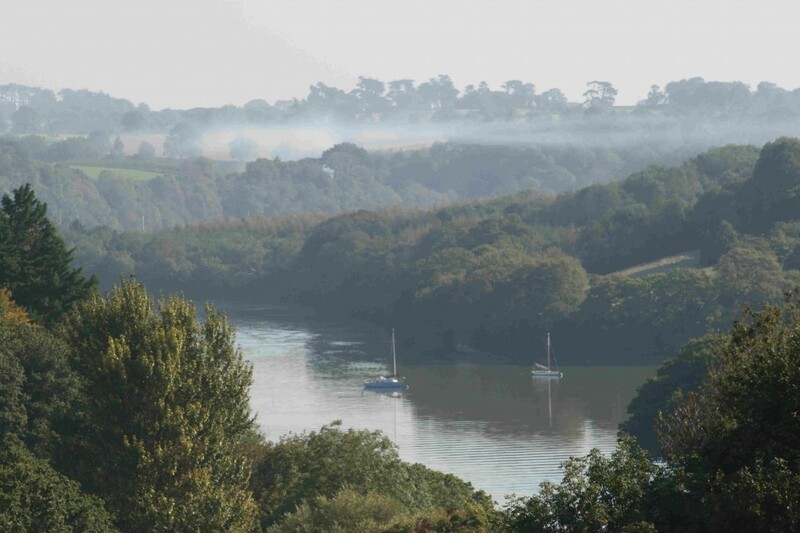 The famous Dit’sum Plum orchards flourish still and Agatha Christie’s house, Greenway, is to be seen amongst the trees in the distance across the water on the far bank. Without doubt it is the perfect setting for a beautiful summer afternoon walk; I will hold the faith that the rain will cease. It did stop briefly for our open days here at Bramble Torre recently. After frantic preparations dashing out between showers or simply getting soaked again and again, we managed to be ready to open despite the weather. Grass was cut, edges trimmed, beds weeded, planting out completed but, best of all, my tiny new Parterre was completed in the nick of time. Well, a grandiose name for my small space, but never the less a little terrace of box hedge, narrow paths and gravel all beautifully laid out by Stephen who somehow managed to replicate the picture in my head. 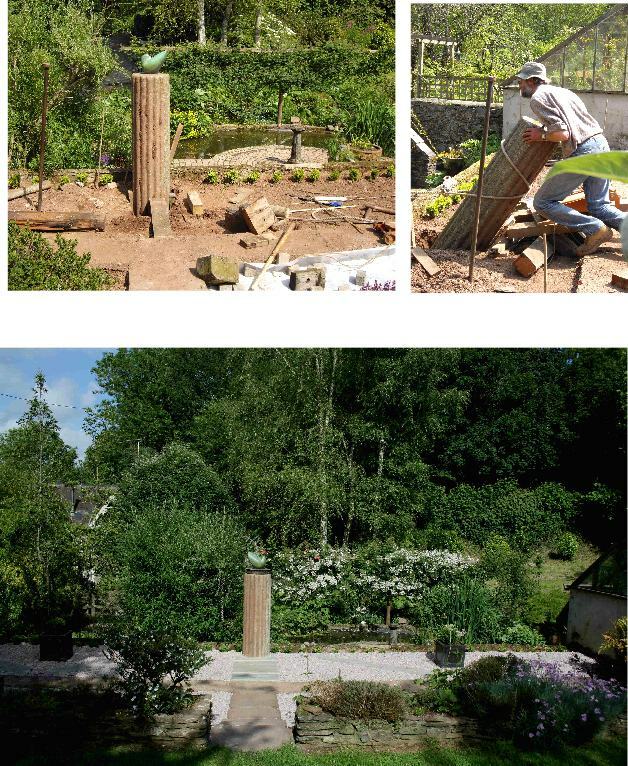 A huge old stone roller, a relic of the days of horse drawn farming, was moved in the manner of Stonehenge across the garden to form a centre piece upon which to display a little Bronze Bird by Bridget McCrum. Despite all the hard work I was still far from optimistic that anyone would turn up and risk a soaking just to look at our horticultural efforts. I was wrong. We had two dry afternoons and the visitors flocked in. Warmed by the sun, buds unfurled their damp petals. Water lilies, so unceremoniously divided and replanted by me last winter, suddenly exploded into a mass of waxy white flowers, foxgloves and delphiniums stood to attention beside spiky verbena bonariensis. A bank of blue geraniums nodded in the gentle warmth. Hostas and Solomon Seal stood up against the slugs. Even the roses, weeks late, began to flower at last. And strangely the afore mentioned embothrium held onto its scarletness weeks later than usual and added to the cacophony of singing colours. The vegetable garden tried to put on a brave face. Despite neatly strimmed grass and crisply trimmed box hedge, it is struggling. Sweet peas still cling reluctantly to the bottom of their wigwam, flowering feebly. Beans refuse to move due to extreme low night time temperatures. Sweet corn is on a go slow and courgettes seem to have shrunk into the ground, smaller indeed than when I planted them out. 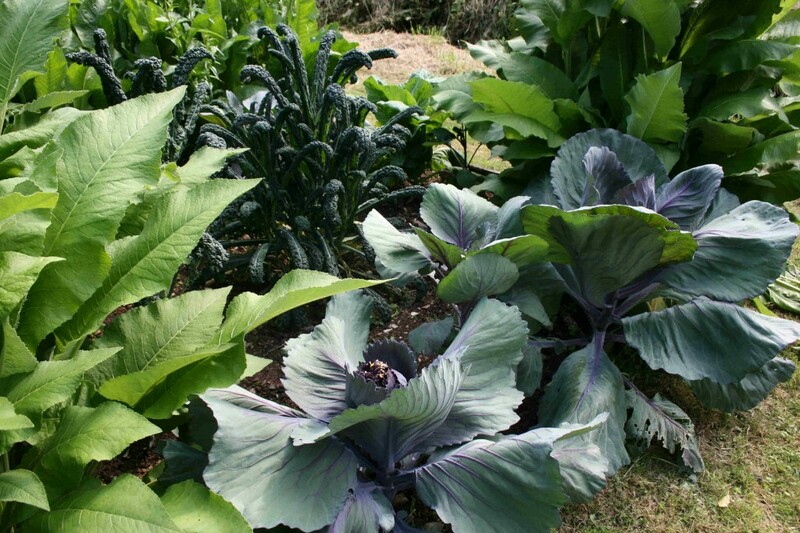 Only majestic old Cavalo Nero and huge red cabbages thrive between the giant leaves of Inula and horse radish; a very strange year indeed. But despite all this everybody enjoyed themselves, delighted, they told me, to be out in the sunshine at last. Cream teas, donated by The Anchorestone Café and the Dartmouth Dairy, flew off the shelf with the help of a band of wonderful helpers, despite outdoor seating and a stiff breeze; and we had no rain! So all in all sharing our beautiful village and raising money for Macmillan, Marie Curie, Help the Hospices and Cross Road Care through the NGS is indeed very worthwhile if a little nerve wracking this year. We won’t let any sort of Rain, Sideways or vertical, beat us! As the year rolls around once more we head for summer. The rain has stopped at last, the sun is shining and finally the temperature has risen to a seasonal norm; that fearsome east wind has dropped. Lambs thrive on the top fields, the embothrium glows scarlet once more against the blue sky and a slightly confused garden suddenly bursts into bloom. 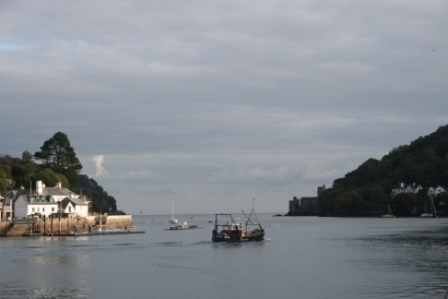 Summer it may be, but October’s Dartmouth Food Festival is already concentrating the minds of many of us, even in May, none more so than David and Holly Jones at Manna from Devon in Kingswear. David is once more chairing a committee that will steer this years’ Festival into its 10th Anniversary. How the Festival has grown from its tiny beginnings in the Market Square ten years ago to the nationally heralded event it is today; an astonishingly rapid journey of success. Now every part of the town is taken up with tents and events. Volunteers queue up to help, more and more businesses are pitching in. 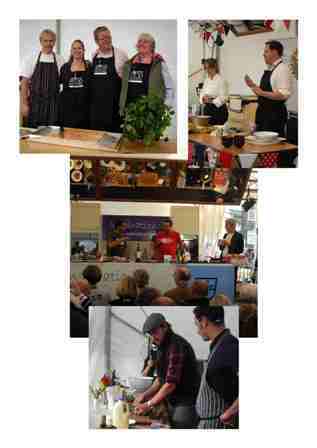 Celebrity Chefs flock to Dartmouth to take part. We find them in cookery theatres, giving talks, signing their latest books, producing fabulous food and generally enthusing us all. 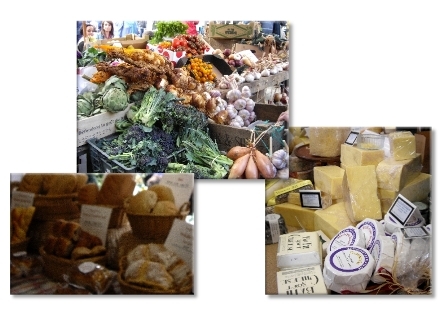 Local producers fill the market, restaurants put on special events, the town buzzes with activity and we, the public, arrive en masse, numbers swelling each year, thrilled to take part. Last year the sun even shone. David and Holly arrived in Kingswear ten years ago. After two years catering at the Royal Dart Yacht Club they moved into Mount Fir House. While setting up the most comfortable of B&B’s they did the rounds of farmers markets and private parties. Looking to add more to their repertoire David went on a three day cookery course up country; he came back telling Holly he’d had a eureka moment and they would start a Cookery School. Holly, a graduate of Pru Leith’s famous cookery school, took a little more convincing! Holly and David had met some twenty years earlier at London University but lost touch. David left school with a place at catering college; he joined the Navy instead. Fifteen years’ experience in management consultancy running courses in team and leadership training followed, developing his exceptional teaching skills needed at the cookery school. 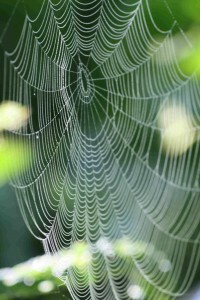 He has an ease which belies the depth of his knowledge and expertise. After university Holly went into the army and had numerous outward bound adventures. Leith’s followed, then a career as a cook, food writer and presenter. 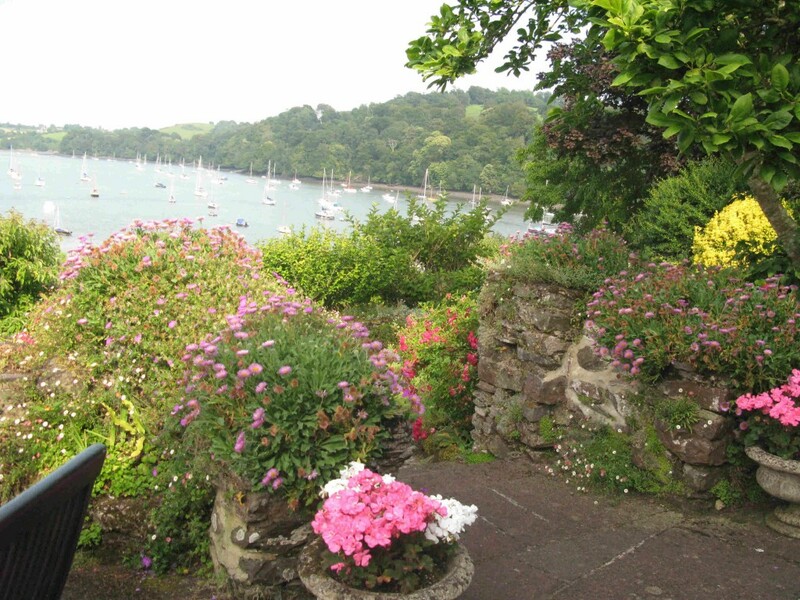 In 2002 Holly Jones Ltd was formed, the parent company to Manna from Devon. The cookery school has a wide remit now with courses in bread making, fish cookery, Mediterranean and Asian food, family days, wood fired oven days, private groups and, yes, even team days! I have been lucky enough to enjoy a number of excellent day courses since its beginning. A couple of years ago I took two of my small grandchildren for a “Kids Bread and Pasta Day”. After the exhaustingly wonderful discovery that any amount of flour covering, kneading, stickiness, baking and rolling can be transformed into deliciousness, we left Mount Fir House travelling home up river on the ferry. To the surprise of fellow passengers we managed to balance our boxes and bags of fresh bread and soft golden pasta as the boat rolled on the tide; the children are still talking about it! 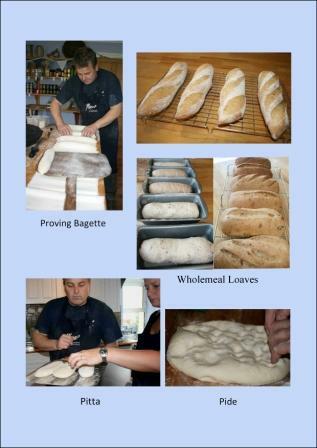 This week I spent a day at Manna from Devon bread making with Jo from Annabel’s Kitchen in Dartmouth. Although I’ve been making bread on and off for years I find I am dogged with erratic results. Now I know why. David took us back to the very beginning, then, step by step, he helped me put the missing pieces of my bread making jigsaw into place. We made a basic white bread mix but varied the water content and watched how this affected the dough as it rose and cooked: 60%water for basic crumb,70% for baguette, 80% ciabatta etc etc. Don’t add more flour as you knead the dough, it upsets the balance. Salt strengthens gluten, slows down yeast and so on and so on. The penny began to drop! We made wholemeal bread using different percentages of white and brown flour. We flavoured the loaves with cheese and wild garlic from the garden, with honey and sunflower seed, with walnuts and thyme. As we kneaded and folded and weighed up and waited, shaped and baked, Holly was beavering away quietly producing a delicious lentil soup for our lunch accompanied by our very first hot rolls. A “Nan” dough with yogurt followed. 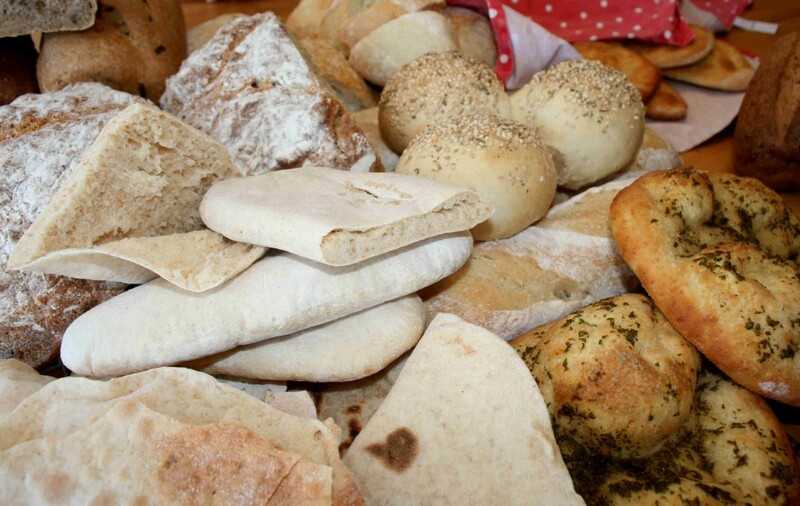 With David’s help we transformed it into no less than five different types of bread: Piadina wraps cooked in a hot frying pan, Carta di Musica like crispy poppadum’s, perfect Pitta breads, round soft glistening little Pide and, of course, Nan itself. And finally we made traditional Irish Soda bread; solid and sustaining, yeast free and very quick. The array of bread at the end of the day was quite breath taking! Once again I left with a box of fabulous bread, by car this time, my head buzzing with instruction and ideas. 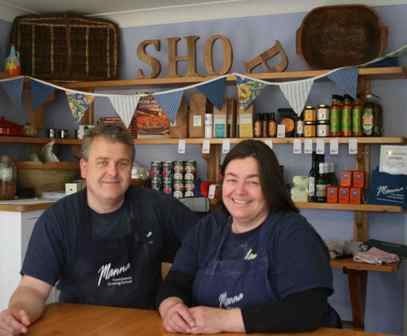 The magic, I think, of Manna from Devon is David and Holly’s extraordinary ability to combine huge expertise, knowledge and professionalism with a wonderful relaxed warmth, humour, enthusiasm and informality, so beguiling that nerves fade quickly as the cooking begins. No wonder the school is going from strength to strength; theirs is a rare talent. Untitled from Paul Vincent on Vimeo. Winter is behind us once more. Clocks have sprung forward, Summer Time has arrived, and light evenings are back at last. A fierce March sun blazes down on the valley. Unusually strong for the time of year, it warms our backs and coaxes tired old grass into growth. Newly ploughed fields glow like dark melting chocolate under a cloudless blue sky. Ecstatic birds fill the air with their rejoicing. A heron dives optimistically into the stream. The swans are back on the Creek. The mill pond is a cacophony of quacking. Daffodils, yellow, orange, white, spread across the orchard. They seem to sing in harmony above the primrose carpet. Camellias, planted just a few years ago, are suddenly overburdened with huge blooms, flowering for week’s, they defy wind and frost. And yet, I am told from all sides, I must not celebrate any of this gloriousness because, despite recent downpours and heavy morning dew down here in the South West at least, this wonderful weather threatens future drought. We’re lambing again too. This gentle weather is perfect for new life; nine strong babies so far in rapid succession. Yet all the while we are reminded not to rejoice at this either, our next infants may be infected with the “Schmallenberg” virus, a deadly threat lurking in the wings. Just one case so far in the South West but news bulletins keep us constantly in fear. Apparently the infection is carried across Europe by midges. There is absolutely nothing we can do to control the situation but cross fingers and pray. 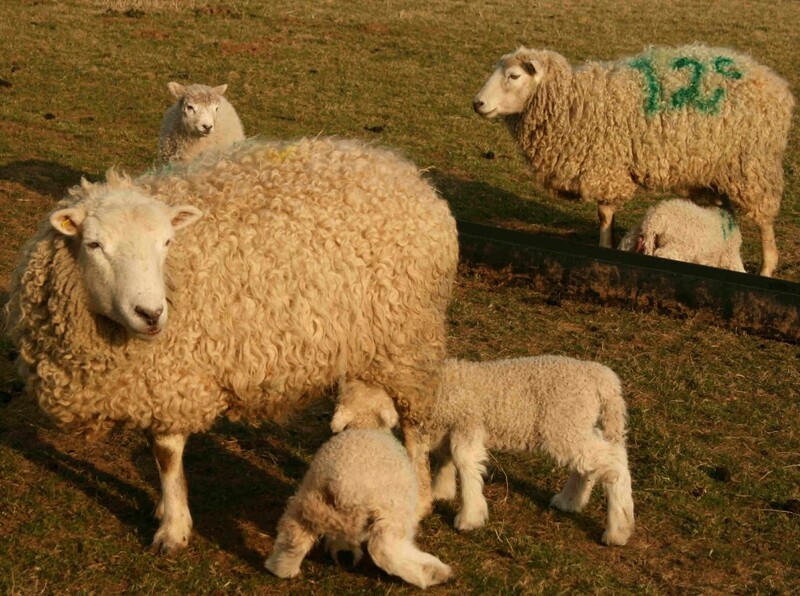 I must not enjoy the sun because it may not rain, my lambs may all be born deformed or dead, so says the media. As I drive through narrow Devon lanes, having just filled the empty tank of my very ordinary car with an eye watering £83 worth of diesel, I am reminded that fuel cost has become so huge few of us can move about freely anymore. And if the threatened tanker driver’s strike comes to fruition none of us will be going anywhere at all. I am told I must not “share a bottle of wine with my partner” because we will surely become ill and die of cancer or heart disease. Old people with dementia, of which I will doubtless soon be one according to statistics, that is, if I live, are being starved by overworked hospital staff or locked up in wards “for their own safety”. As the government are “damned if they do and damned if they don’t”, whichever way they try to tackle this national malaise, I begin to feel overwhelmed by an epidemic of despair and fear. A “what if” culture seems to have us by the throat. But, hey, it may rain very soon, as it always does just in time for the Easter holiday! Our lambs may all be born strong and healthy after all. The fuel strike may not happen. I may live to nearly 103 like my father who still loves to discuss current affairs over a glass of sherry. This evening on the phone: “will this Granny Tax affect you? Who’s suffering from all this dementia? Should Cameron have had these people to supper….and how is the economy?” I may escape hospital like him. And maybe even die at home without ever suffering the downward spiral of Alzheimer’s. So I tend the ewes with new lambs, feed the wethers and the yearlings, talk to the donkeys, dig the garden, celebrate my newly reconstructed old greenhouse, clear mud from the pond, collect eggs and clean out the chickens, walk over the hills with my dogs and my camera, ponder when to get more pigs, do the accounts, cook “kitchen suppers” for my friends even if they don’t donate to my chosen charity, and risk that second glass of wine. I feel inclined to rejoice regardless at what we have, rather than negate the beauty of the present by fretting about what may never happen in the future. Oh, and the pork was wonderful too; the pigs a great success. Richard Pollard our butcher, pollardQmeats@hotmail.co.uk , did an excellent job; delicious sausages, bacon and gammon, shoulders and legs neatly boned and rolled ready for stuffing, belly boned for slow roasting till crisp and cracklingy, loin chops cut thick to cook slowly under the grill till dark and golden. Pork as it used to taste. “Have you any left”? “When can we have some more”? I must get more pigs! Friends for supper last week so I thought I would do something with the pork fillet but it looked a little small for four of us. 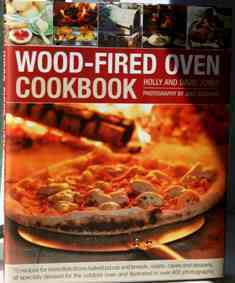 Trawling idly through my mass of cookery books, Hugh Fernley-Whittingstall’s Meat Book came up trumps again, but, of course I didn’t have exactly the ingredients he suggested. So, instead of the mincemeat and dried chestnuts that he suggests, I used my own dried prunes; last summer’s Dit’sum plums dried slowly overnight in the bottom oven of the Everhot then stored in an air tight jar. I split my little fillet nearly in half and filled the cavity with our sausage meat, salt, fresh ground black pepper and the pitted prunes. I tied the whole with string to make a big oblong, then wrapped it loosely in tin foil leaving the top exposed, poured lemon juice over it and chilled it in the fridge while I went into the garden to dig the very last Pink Fir Apple potatoes and pick winter spinach. The pork went into a hot oven, 200C, for an hour until well done and golden. As the potatoes cooked I took the meat out of the oven, covered it and let it rest in a warm place on top of the cooker. I made a sauce with chicken stock, a table spoon of redcurrant jelly, and a pinch of cinnamon. I slaked a desert spoon of cornflour into a little extra stock, stirred that into the sauce and brought it just to the boil, stirring all the time until it thickened. Finally I stirred in a couple of tablespoons of cream, tasted the sauce and added seasoning. The washed and destalked spinach wilted quickly in its own water. The secret with spinach is no extra water and the quickest possible cooking. I still needed to drain it thoroughly and press it down in the colander to really get it dry. A quick stir over the heat with a knob of butter and it was ready too. As I sliced the pork and served my friends it suddenly occurred to me that I had produced everything on the plate ! Not pudding though; I found Nigel Slater’s wonderful quick lemon curd ice cream recipe in his lovely book, Kitchen Diaries. Speedy to make, it is sharp and delicious after the rich unctuous pork. 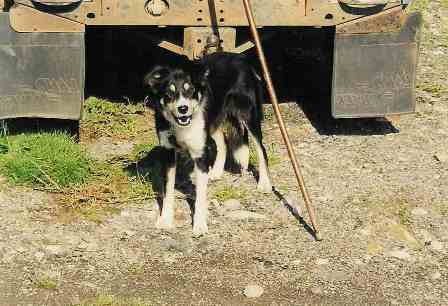 Today we lost our beloved old sheepdog, Meg, loyal friend and wonderful working dog of 15 years. We miss her terribly but she had a long and happy doggy life, sweet girl. 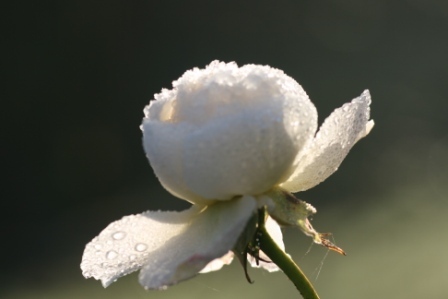 This morning’s hard frost came as quite a surprise. 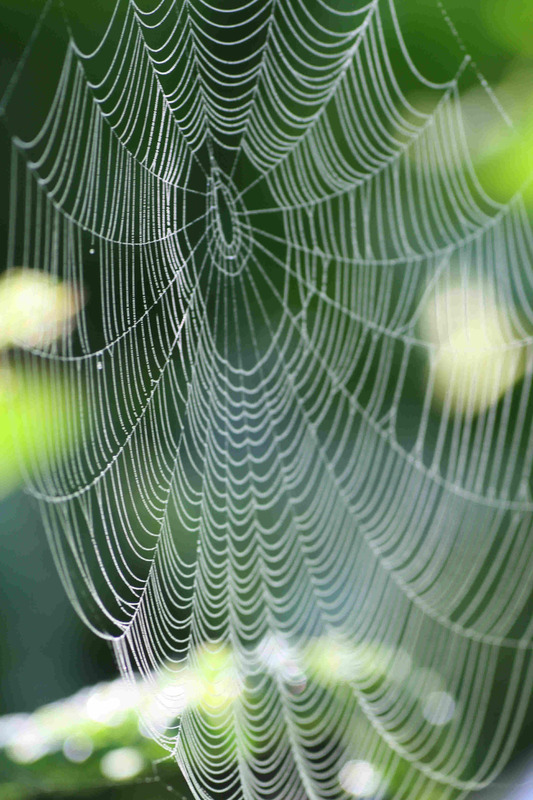 The mild, damp weather of the last two months has lulled us into a sense of false security. No snow, no frozen water troughs or icy farmyard. No heaving of water buckets from the stream to quench the thirst of chilly livestock. No throbbing, freezy fingers, no numb toes paralyzed with cold inside unrelenting wellies, no scarlet, stinging nose poking out of balaclava, whipped numb by the east wind; well, not yet anyway. 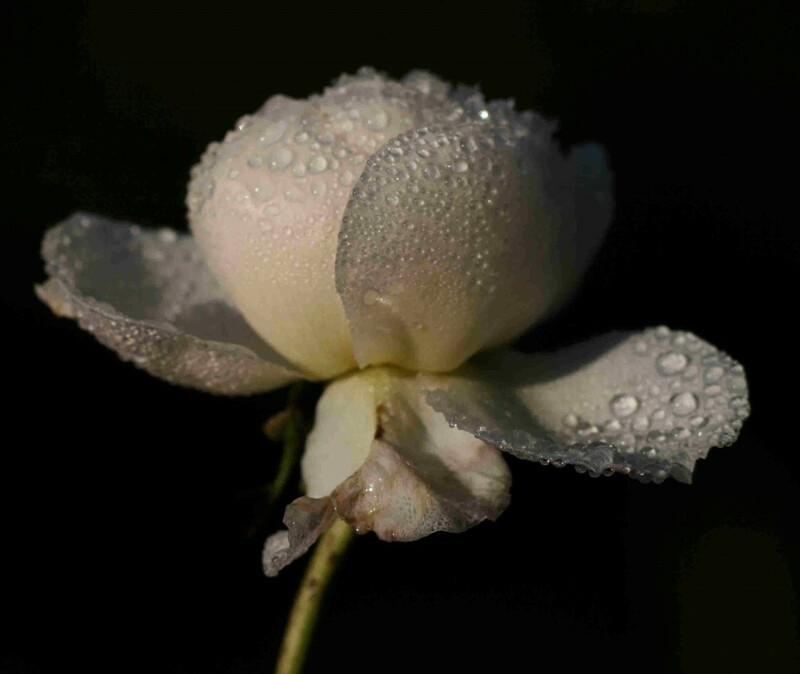 The grass continues to grow, spring bulbs push up through mud, snowdrops promise another avalanche of white, while camellias take enormous risks bursting into a profusion of pinks, forgetting completely the perils of early morning sun on icy petals. Even roses continue to produce funny ragged little flowers. It can’t last. A cold snap is bound to arrive but for now the garden seems to think spring is already on its way; I wish! Fat ewes munch happily in the rain. The wethers, growing fast, race up to me each morning. Bucket tame, they jostle for their breakfast. Last year’s ewe lambs, round and fat now, graze quietly on the top field we call “Dainty” after a naughty erstwhile pony. As for the pigs they are getting so big. To quote Hugh Fearnly-Wittingstall’s description of his porkers in his wonderful “River Cottage Meat Book”: they arrived as fat puppies and now resemble small hippos. Little hippos they are indeed, I’m learning why it is that so many people love pigs; they are so intelligent, so entertaining. They just make me smile! But sadly it is also becoming clear to me why they are the most abused of farm animals. They require such different husbandry than sheep and cattle. 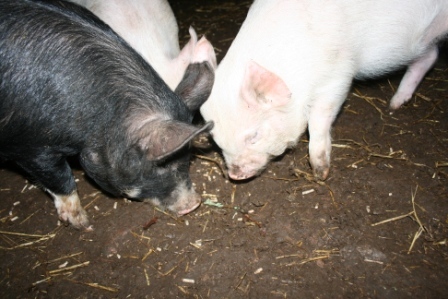 We are fortunate in the UK that new legislation forbids the use of sow crates. 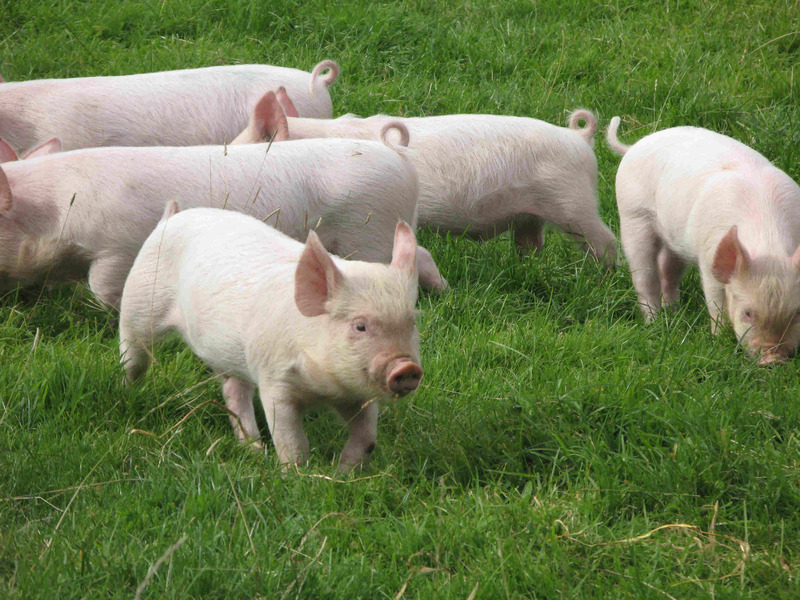 UK pigs must have a minimum space in which to exist; still not so great but much, much better than overseas. Sadly this has led to a rise in price in UK pork which in turn means that cheap foreign meat which comes nowhere near our welfare standards, is flooding the market and severely threatening our pig farmers. 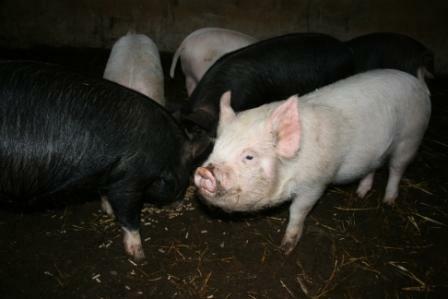 Pigs need regular feeding and attention twice a day. Since the dreadful Foot and Mouth outbreak ten years ago strict laws are in place in this country controlling their diet; no more kitchen scraps or “pig swill”. We must feed only certified pig nuts. Pigs eat neither grass nor straw but love to rootle round in search of tasty morsels in the ground, truffles if possible! Such enthusiasm leads to large holes and much mud but despite this fun they are extraordinarily clean, keeping their sleeping quarters immaculate and pooing only in one designated place. The defamatory “Living like Pigs” is, without doubt, a reflection not of the creatures themselves but of their human captors. My weaners demand and deserve respect and care during their short lives and they will reward that care and attention with wonderful pork. No pigs to be seen at this year’s Dartmouth Fat Stock Show. There were sheep, all breeds and sizes, cattle, massive, large and small and yards and yards of ready dressed turkeys. 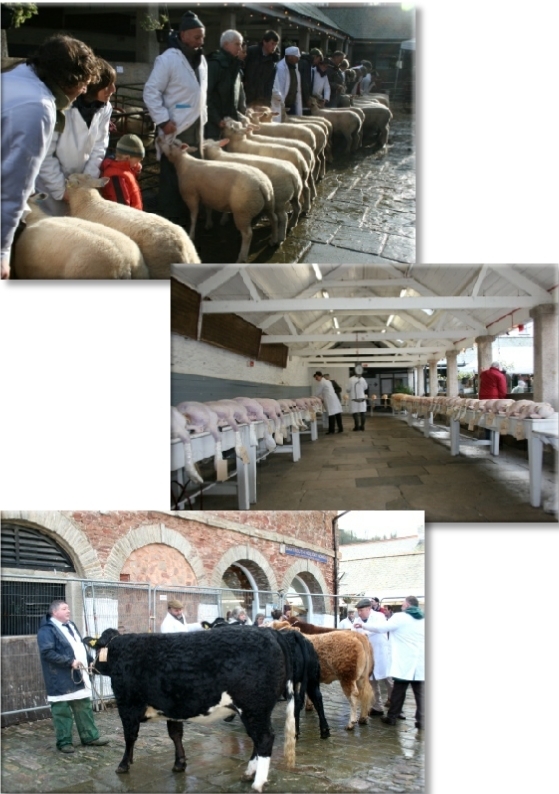 The beautifully restored and refurbished Market Place was filled once more with livestock, as it has been every December over so many years. 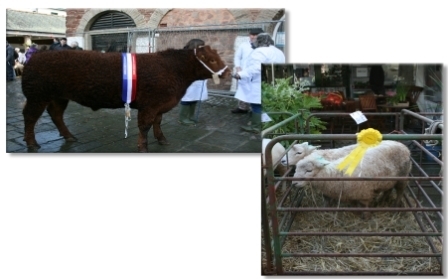 All the local farming community, young and old, were there for this historic annual meet. Rain, sleet and sunshine took turns with an icy wind which curled around the market walls. The Dartmouth Market we know today was built in 1823. 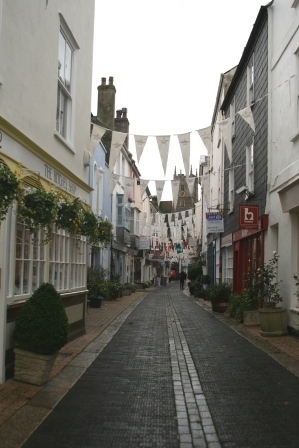 In the 12th century Dartmouth was the fourth most important town in Devon. It was already meeting the needs of commercial shipping. Smith Street, Higher Street and Lower Street formed the town centre on the water’s edge; merchant houses and warehouses backed onto the river making it easy to load and unload cargoes straight from ships. Boats lay alongside for repairs and the quay side was a thriving marketplace, the earliest recorded in 1231. It was a popular place with brewers and vintners! In 1364 it received the Charter of Merchant Vintners increasing trade in cloth and herring as well as wine. Everything arrived by river. It is so hard to imagine Victoria Road under water until the beginning of the 19th Century. No wheeled vehicle, neither cart nor carriage, could get down the steep hill into the town. The only land access was on horseback and the only carriers were pack ponies. It was not until the Improvement Act of Parliament in 1815 that drainage and land reclamation began in earnest. The crossing places at North Ford and South Ford, uniting the two small towns of Hardness and Clifton, became dry land at last. By the 1820’s Foss Street was dry land too, leading to the newly built Market Place. 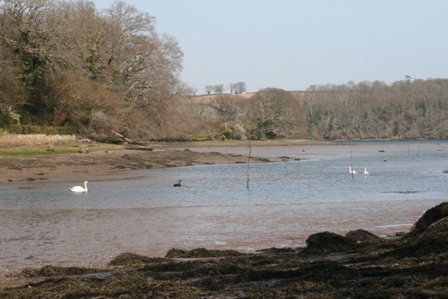 At the same time as the construction of the market, the engineer, James Rendall, was working on the New Road to Townstall which would enable horse drawn carriages to join the Turnpike to Kingsbridge and Modbury. For the first time in Dartmouth’s history wheeled vehicles were able to travel to and from the town. Local trade increased dramatically. Farmers were able to bring more produce down to market; no longer were the people solely dependent on the river for food and trade. The New Road was renamed Victoria Road at Queen Victoria’s Jubilee. I wonder where Queen Elizabeth Road will be! And today the Market is still thriving, restored and modernised once again with plate glass and stainless steel, it houses even more businesses than ever, while still remaining true to its roots. Weekly markets and the Farmers Market flourish and of course the wonderful annual Fat Stock Show each December which still brings livestock into town. Foss Street shows little evidence of its watery past. 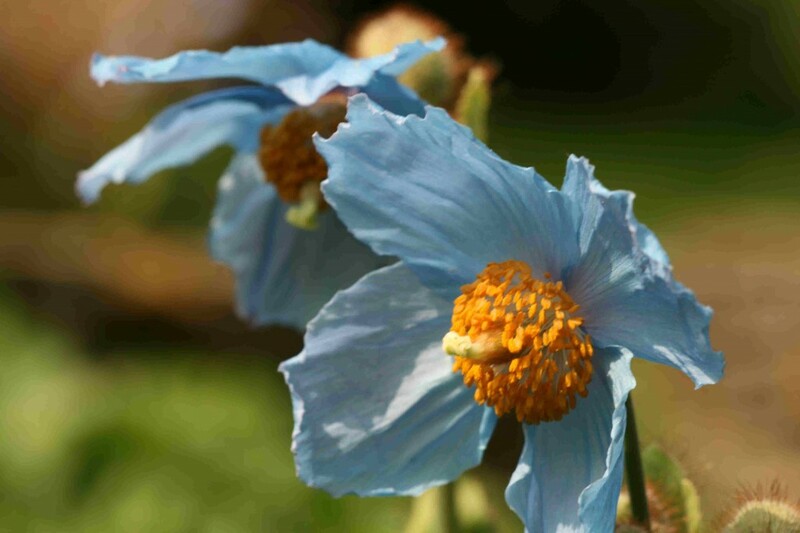 Bedecked with flowers in summer it gives us such treasures as Simon Drew and Coombe Farm Gallery. 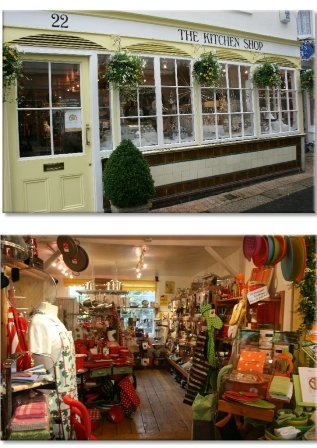 Pat Candy’s Kitchen Shop is one of my favourites. I have to own I find kitchen shops irresistible anywhere and everywhere in the world. 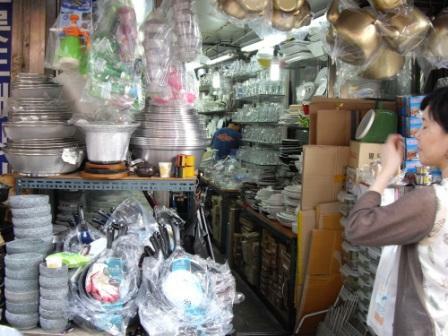 I even found one in Soeul in Korea this September; quite marvellous, piled high with unrecognisable kitchen utensils that fortunately wouldn’t fit into my suitcase. But back to Dartmouth; here on our doorstep we find a local market selling wonderful local produce and right round the corner one of the best suppliers of the were-with-all to transform it into something special. Not only is Pat Candy a retailer with years of experience, a huge knowledge of her merchandise and a fantastic flair for presentation, but, she is a cook! It is this, above all else, which gives the Kitchen Shop it’s edge. I choose the ingredients for soup according to the sort of stock I have in the freezer. This time it’s ham. Onions or shallots are a must and peas go so well with ham but the other ingredients just happen to be in the fridge; the last piece of a large pumpkin, a potato, a couple of large shallots, two big garlic cloves, some parsley stalks, a little salt (ham stock can be salty) and pepper. 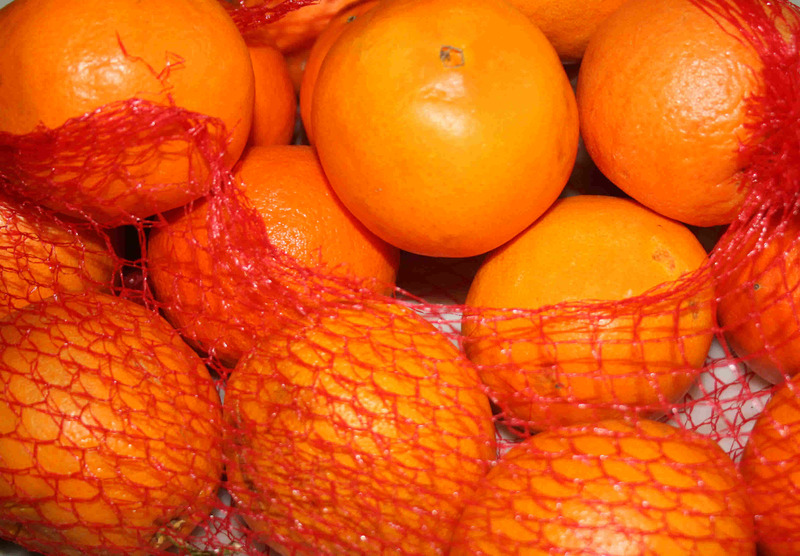 I bought an absurdly large net of ripe unctuous oranges in Portugal last week. They were irresistible, for sale by the side of the road direct from the farmer for just 2 Euro. Ripe and soft they bore no resemblance to the hard, artificially ripened, waxed orange tennis balls we buy here. But what to do with then once home? I realised greed had driven me to weigh down my bag! I scoured my not so small collection of cookery books. 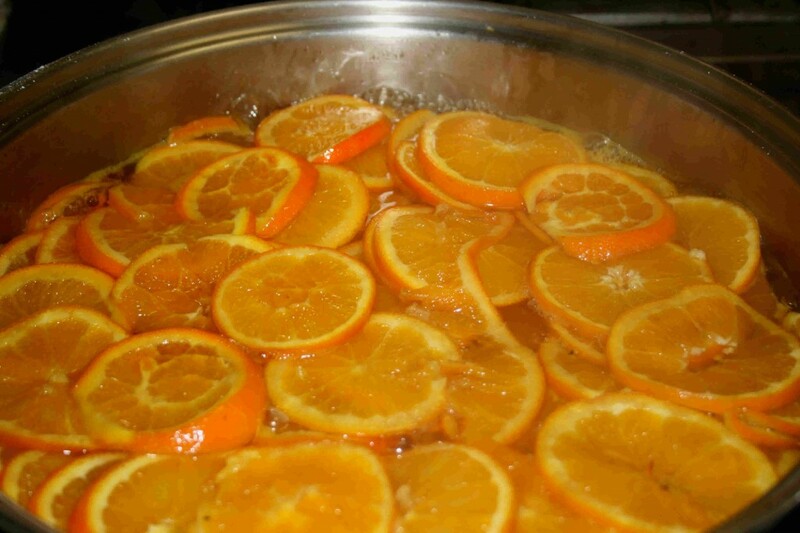 No more marmalade this year, I’ve made too much already and spiced orange in vinegar just doesn’t appeal. So I sliced the whole fruit very thin, poached the slices quickly in a strong sugar syrup, an equal quantity of water to sugar till slightly sticky and shiny. 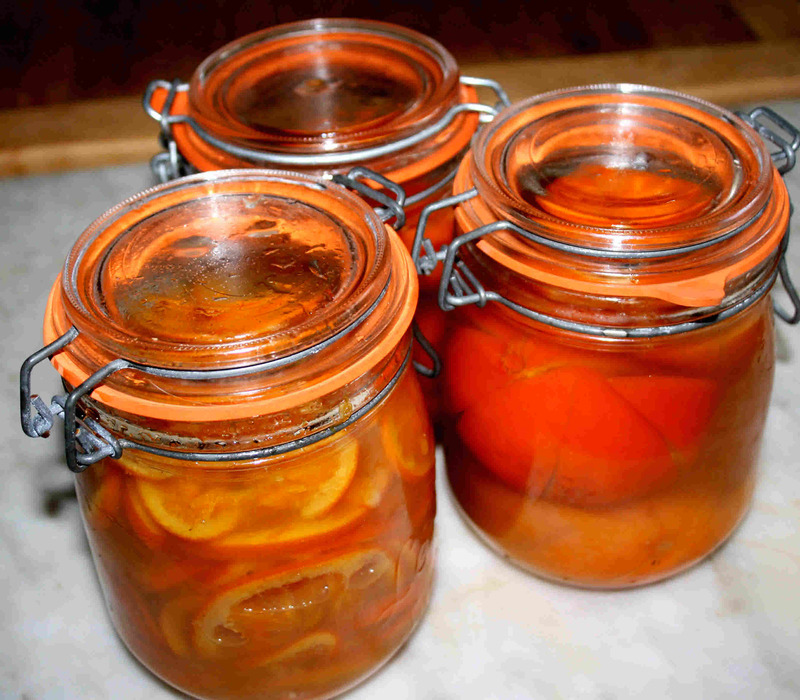 I potted up the glistening fruit into large Kilner jars and topped up the syrup with orange liqueur. The smell was wonderful. I sealed the jars and put them at the back of the fridge to mature.